Exactly like the ‘A’ team, except instead of leaping out of vans and making crafty escapes using ingenuity, welding rods and cunning, we dress as Paparazzi, stalk your guests and take some great photographs! Spoof Paparazzi are an essential ingredient for many events, from Product Launches and Corporate Functions through to Hollywood themed parties. We guarantee that your guests will be wowed by our presence. We have the perfect balance between entertainment value and photographic excellence. We create a great atmosphere AND take superb photographs! We are professional and insured photographers, using only high quality professional kit. We are also larger than life and full of personality, able to deliver the full force of the PAP encounter. So you will get the best of both worlds, a full Paparazzi experience coupled with premium pictures! For both of our offerings we offer a FREE password protected website to display your pictures after the event. 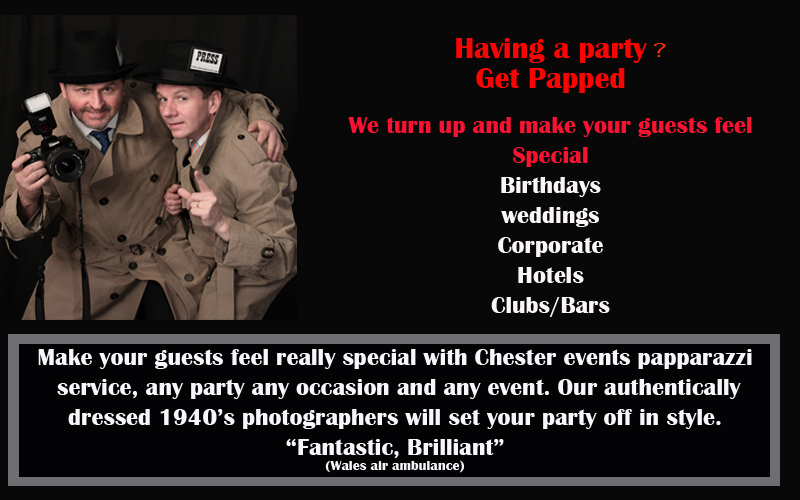 We can provide 2 spoof paparazzi to stalk and entertain your guests as they arrive. We can guarantee smiles on faces even before the front door is reached! Typically we’ll ambush your guests on arrival we will stay in full costume , provide props, have a giggle, and continue during and after your party. All high quality images will be placed on a CD for you to print as and when.